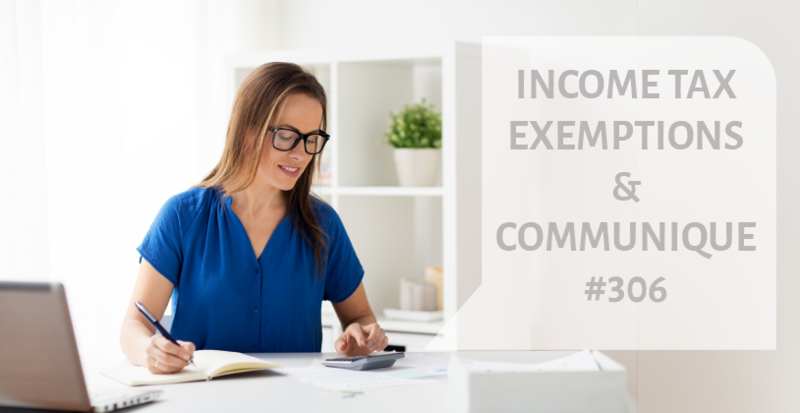 income tax return for compensation payments. The 7162 numbered Law has regulated that the ones who benefit from tradesman exception shall also benefit from tradesman exception when they sell home-made products online as of 30.01.2019. According to the regulation made with the Communique, the sales amount shall not exceed the annual gross minimum wage amount for the related year in order to benefit from this exception. This provision is only applicable for the online sales; that is to say, if a part of this sale will not be online, an amount limitation will not be the subject. If this limit will be exceeded for online sales, the tradesman exception will be lost, and income tax obligation shall be imposed as of the beginning of the following calendar year. If the ones who are obliged with stoppage, will buy products (online or in other ways under exception) from the exempted tradesman, a withholding with the rate of 2% needs to be imposed. In addition to this, it is possible to prove the payments made for the online sales, with bank receipts (of which includes information need to be in note of expenses, except for the signature). 70% of the actual net value of the monthly salary (the rest of amount after deducting discounts such as the insurance premium, life insurance and union contributions from benefits provided by the employer) of pilots and certified cabin attendants who assigned to fly in Turkish Air Institution or the institutions of which legal head office is in Turkey, shall be exempted from income tax as of 01.02.2019. According to the related regulation, it should be noted that other benefits such as premium, bonus etc are the secondary of the salary so that they will be considered within the scope of the salary. Thus, the rest 30% amount after exempting the 70% of the actual net monthly salary, shall be subjected to the income tax. As is known, it was stated in the 7162 numbered Law that the income tax collected from the compensations made to the employees who left their jobs by conducting a settlement agreement before 27.03.2018, shall be rejected and returned (if the said employee did not bring a lawsuit or waived from the lawsuit that is brought before). In order to benefit from this regulation, related payment has to be done until 27.03.2018 and its tax payment shall be made to the tax office. Applications regarding the period prior to 01.01.2014 are not accepted due to prescription. Another condition of the regulation is; there shall not be any lawsuits filed in regards. If employee files a lawsuit after receiving the refund, refunded amounts will be received back with fine and interest included. Lawsuits which have been filed previously and still in progress have to be relinquished by the employee. Also, in cases of contracts which were signed after 27.03.2018, and contracts which have been signed before this date, but its compensation was paid after the related date will not be subject to the related regulation. In order to receive the related refund, employee shall declare the sample petition attached to communique numbered 306, settlement agreement and a document (salary payroll etc.) which indicates that the related tax cut has been made as per the agreement. These documents could be delivered personally, via mail or digitally over the Interactive Tax Office. Income taxes of notice payment, official holiday, annual leave, transportation and meal payments and service premiums will not be reimbursed since they are not qualified as additional compensation. Compensations of unemployment to be paid due to 4857 numbered Law. (i)The unemployment payments made to the unemployed insurant for the unemployed period and (ii) the compensation with at least four – at most eight months of salary amount in case the employee did not start working within 1 months as of the Court’s decision regarding the invalidity of the termination, shall be considered within the exemption. If both parties agree on not employing the employee after the mediation procedure, the unemployment compensation up to eight months of salary shall be deemed under the exemption.